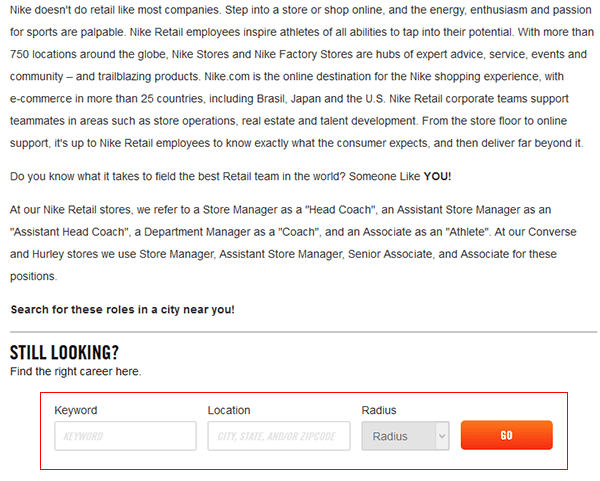 Follow the steps in the guide posted below to learn more about how to fill out and submit the Niketown job application (online). Several different types of careers can be applied for online by registering an account and completing the application process. The guide in the below section provides a general overview of how to register a new account, search for positions in your area, and complete the application form. About the Company: Niketown is the retail store chain of Nike, Inc. There are numerous retail locations throughout the world. Nike, Inc. was founded in 1964 and employs more than 70,000 across a wide range of industries. Step 1 – Start by going to the company’s employment site. Press this link to open the site in a new browser window/tab. 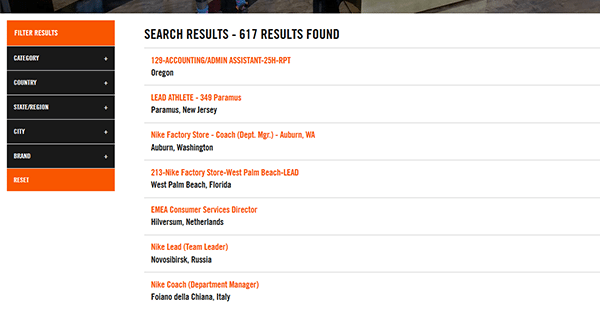 Note: If you want to go directly to Nike’s main employment site click the button at the top of this page. Step 2 – Scroll down the page until you arrive at the search form. Enter a keyword and location into the input fields and then press the “Go” button to load the list of current openings in your area. Step 3 – The list of results can be filtered by category, country, state/region, city, or brand. Step 4 – Click the link of the position that you want to fill out an application for. Step 5 – Review the job description and then click the button as outlined in red in the below screenshot. Step 6 – Read and then accept the privacy agreement (click the “I Accept” button). Step 7 – Sign in to your account or press the “New User” button if you need to create a new account. Step 9 – After you have created your account you will be able to start filling out the application form.